A beautiful smile is one of the most attractive features a person can have. It’s important to take excellent care of your teeth. Even if you maintain excellent oral health, you may be at risk for gaps between your teeth. In some cases, a gap can grow bigger over time making it more noticeable. Luckily, the gap does not have to be permanent. There are several dental procedures you can choose from too close the gaps between your teeth. There are many issues that may cause a gap between your teeth. If your jaw is misaligned, the space between your teeth can increase due to crowding of your other teeth. If you have missing or undersized teeth, it can cause the neighboring teeth to move and shift, creating a gap. Habits such as sucking your thumb can pull your front teeth and create a gap. Spaces can develop if your swallowing reflex does not function properly as well. When you swallow, your tongue should normally push against the roof of your mouth. However, some people tend to thrust their tongue forward against their front teeth. When this occurs, your front teeth can move and create a gap. Gum disease can also weaken your jaw resulting in gaps between your teeth. Whatever the cause, your dentist can evaluate your situation to see which dental procedure is right for you. Dental bonding is the fastest and most affordable option to fix any gaps between your teeth. The procedure involves applying a tooth-colored resin material to your teeth. The material is adapted to shape and looks exactly like your teeth. A UV light will be used to harden the material and the gap will close. The bonding procedure can be completed in one office visit and it takes about 30 to 60 minutes. Even though it is the most affordable and simplest solution, the bonding material is prone to stain. Plus, the procedure uses resin that is not as strong in comparison to other dental materials, so it may chip or break off easily. Luckily, through proper care and maintenance, the bonding material can last for a long period of time. This means that you have to maintain healthy dental habits such as flossing, brushing, and using mouthwash twice a day as well as visiting your dentist twice a year. Porcelain veneers are an excellent option to fix the gap between your teeth. It requires a little more work than dental bonding and is typically more expensive, but the procedure is relatively simple and the results can last for a long period of time. Veneers contain porcelain material that has been shaped in a lab and match the color of your teeth. They are placed in front of your teeth and act as a mask. They cover any imperfections, spaces, or gaps between your teeth. Veneer material is very sturdy and does not easily break. This means you will not have to worry about chipping your veneers. The process is irreversible, so you need to be sure that you are happy with your results. The procedure can also be invasive because a thin layer of the enamel must be removed to make room for the veneers. Unfortunately, without enamel, you will have to rely on your veneers for protection. Even though veneers can correct cosmetic problems, depending on the extent of your gap or space, you might be referred to an orthodontist. If the gap between your teeth cannot be fixed through dental bonding or veneers, you may need to visit an orthodontist. 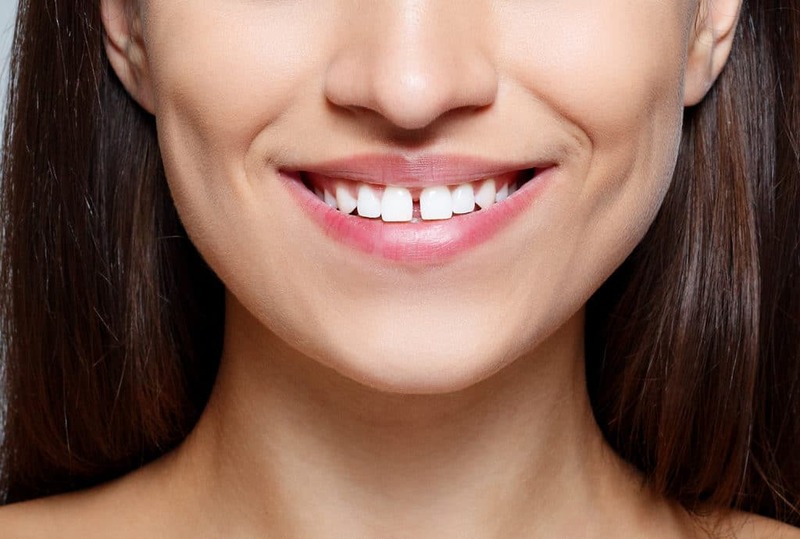 Correcting the gaps between your teeth might not be as simple as you think. However, braces can be used to correct severe gaps. If you do not want metal brackets on your teeth, you may be a candidate for invisible aligners, which are less noticeable and easy to remove. Choosing an orthodontic treatment, such as Invisaligns, over dental bonding and veneers may be an excellent alternative to give your smile the makeover it needs. To successfully close the gaps between your teeth, you should visit a dentist with years of experience. At EVDP dentistry, we have experience in cosmetic procedures used to close gaps. Through a thorough dental examination, we can advise you which procedure is right for you. If you are ready to close the gaps between your teeth, give us a call! ← Invisalign vs. Braces: Which is Better?